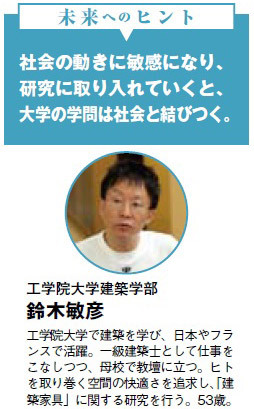 Prof. Suzuki’s research of the Cardboard shelter was introduced to magazine for high school students. It will be help to understand a role as an architect for earthquake refugee. The research on space contributes the improvement of refugee conditions. “Facilities for refugee has water, foods and blankets in store. However it is not sufficient. There is no consideration for privacy. Toshihiko Suzuki, an architect Professor at Kogakuin University, solved the problem by developing the Cardboard shelter. Anyone can put it together in a few minutes and set it up in a gymnasium as a small house. He told us “I emphasized that it works as not only a partition, but also a space with a roof. We are not comfortable under high ceiling. Let us consider “Human scale”. You know, a beach parasol and a cafe roof have the eaves. They are useful structure to make a human space.” Suzuki noticed that and developed the Cardboard shelter to secure the space. He selected cardboard material because of cheapness and recycle possibility. And his university opened its design on website and started mass production with a factory. 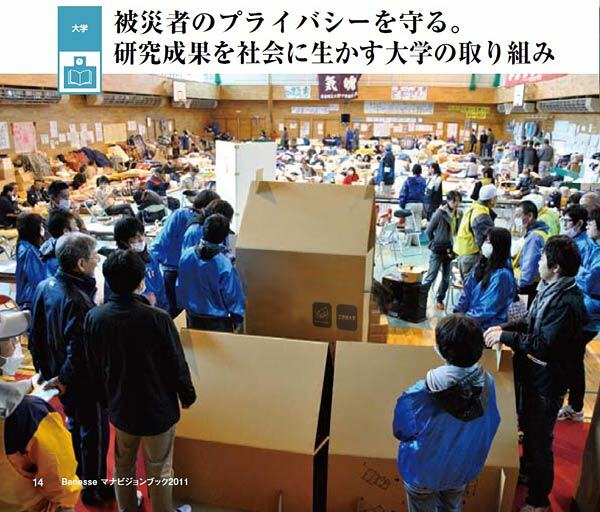 The end of April, his students carried it to the disaster-stricken area as students volunteer. 2 Responses to " ダンボールシェルターを被災地に設置, An article about Cardboard shelter for refugee "